What creates urban buzz? Seeding the next hot neighborhood. What creates buzz and momentum in cities and towns? Why do some neighborhoods catch fire and others languish? There are many factors that contribute to this transformation — location, timing, inspiration… and often a good dose of serendipity. Declaring a neighborhood hip will not make it so, but hoping it will get there on its own is also not a recipe for success. While it may not be possible to dictate a neighborhood’s shift from under-the-radar to hot spot, there are ways to seed its evolution. As we walk through a neighborhood, we are influenced by visual interruptions on the streetscape and by social interactions. Simple cues can multiply and spread in complex and powerful ways, creating a sense that something is happening. This phenomenon – how atoms or individuals interact with one another or their environment – when the collective behavior of the whole is different from that of its parts, is known as “emergence”. We see emergence at work in myriad 21st-century systems, everything from how neighborhoods form to why we are able to find things so quickly on Google. Each place-branding initiative is unique. The geography, density, demographics and culture all contribute to defining the brand. What works for an inner-city neighborhood near universities is different than a small, historic town nestled in the mountains which is different than an island off the coast of New England, etc., etc. While the locations are all different, the brand strategy process is similar. At the core is listening and learning, understanding what is valued, who lives there and who visits, what businesses thrive, what people do for work and for fun, the history and evolution. The process considers what is new and the aspirations for the future — is the goal a significant shift or an expansion (or concentration) of existing ideas. Finding common ground and shared purpose among stakeholders, understanding how to leverage collective strengths, address weaknesses and raise support are all part of the process. Once the core ideas and values of the brand are identified, the tools for engagement and seeding its evolution are developed. Just as each place has unique qualities, the tools for engagement vary. These engagement triggers can be programmatic or virtual, temporary or permanent, expensive or low cost. Critically, the process reveals which interventions will have the most impact. With the understanding and shared purpose created through the place-branding process, activating the brand and building momentum is exciting and the results are often fast and measurable. Kendall Square in Cambridge, Massachusetts possesses enormous creative, intellectual, and economic capital and is recognized globally as one of the leading centers of innovation and technology. When Minelli was engaged in 2014, there was exciting and groundbreaking developments happening in the individual companies and institutions, but very little interaction among the established and start-up communities and minimal street-level activity. The lack of a unified sense of place was undermining the neighborhood’s ability to reach its full potential. 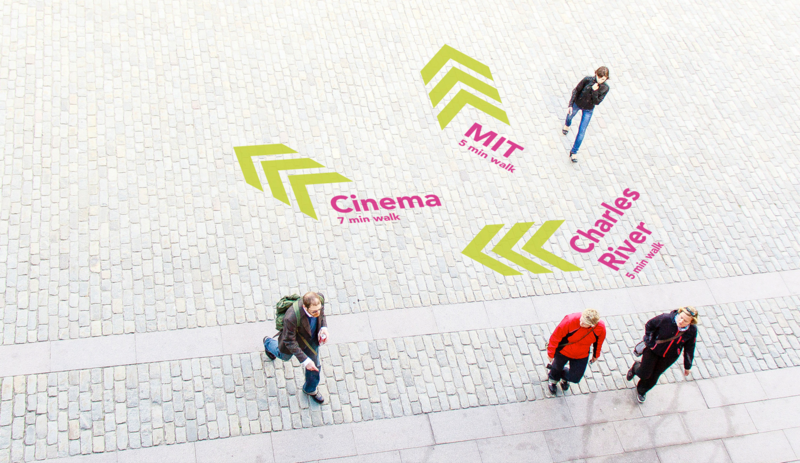 Working collaboratively with the Kendall Square Association, we led a placemaking initiative that resulted in an overarching brand strategy, identity and a set of open-source tools that were used to build a stronger visible presence on the streetscape and an iconic and dynamic brand presence throughout the neighborhood. The new brand was woven into several programs outlined by Minelli, including landmark and wayfinding systems, experiential interventions, civic living rooms and opportunities for public art…sparking the process of emergence, seeding its evolution. Every neighborhood and place has distinct characteristics and potential. The triggers to build engagement and buzz are unique to each location. The discipline of branding is an effective process to build shared purpose and uncover the best interventions for engagement and growth. Minelli, Inc. work related to this post includes: Kendall Square, Boston Creates and 4th Avenue Brooklyn. From the birth of the recycling logo to the call for a circular economy.